The FBI misrepresented its findings to the FISA court on several fronts in order to secure a wiretap to spy on Trump campaign associate Carter Page, recently released documents show. “The FBI continued to tell judges that dossier writer Christopher Steele wasn’t the source of a news article the bureau used to corroborate a wiretap application when in fact Steele had publicly acknowledged that he fed the anti-Trump story,” Rowan Scarborough noted in a July 22 report for The Washington Times. The FBI also failed to tell the FISA court that the Steele dossier was financed by the Hillary Clinton campaign and the Democratic National Committee, according to the documents, obtained in a Freedom of Information Act (FOIA) request by Judicial Watch. The heavily redacted documents also show that the FBI relied on major media stories that were critical of the Trump campaign as evidence in obtaining the FISA warrants. 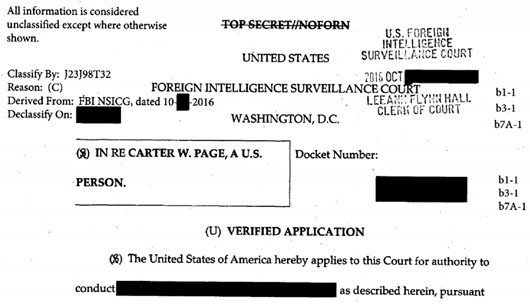 The FBI submitted the warrants for surveillance on Page from October 2016 to September 2017. The FBI told surveillance court judges that Page was an illegal foreign agent of Russia. Page has repeatedly denied this and has not been charged. Unredacted portions of the documents show the Steele dossier was a vital piece of evidence used by the FBI to obtain the FISA warrants. “In other words, the FBI was relying on partisan opposition research to target Page for a year of intrusive phone and electronic intercepts,” Scarborough wrote. The dossier’s central charge against Page is that, during a public speaking trip to Moscow in July 2016, he met with two U.S.-sanctioned Kremlin figures, Igor Sechin and Igor Diveykin. The dossier claimed Page discussed sanctions relief for bribes. Page denies those charges. The FBI presented to the FISA court judges as an independent source a Sept. 23, 2016, article by Michael Isikoff in Yahoo News which reported the same supposed Sechin-Diveykin meetings. The Washington Times first reported on April 25, 2017, that Steele filed a declaration in a libel lawsuit against him in London. He stated that he had personally briefed Yahoo News and other media in September 2016 before the story appeared. The FBI cited other major media stories to augment the wiretap application, Scarborough noted. Several referred to a platform plank at the Republican National Convention dealing with defending Ukraine. “The liberal media narrative was that Trump people watered down the language to please Moscow, which is backing ethnic-Russian separatists in their war against the central government in Kiev. The FBI cited this angle,” Scarborough wrote. Trump aides said the stories were inaccurate. They said the final language was tougher on Russia than the first draft. In the end, the Trump administration sent state-of-the-art Javelin anti-tank missiles to Ukraine in May. Rep. Adam Schiff of California, the top Democrat on the House intelligence committee, has been defending Steele by reading his charges into the transcripts of congressional hearings.